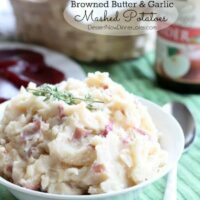 Browned Butter and Garlic Mashed Potatoes - Dessert Now, Dinner Later! 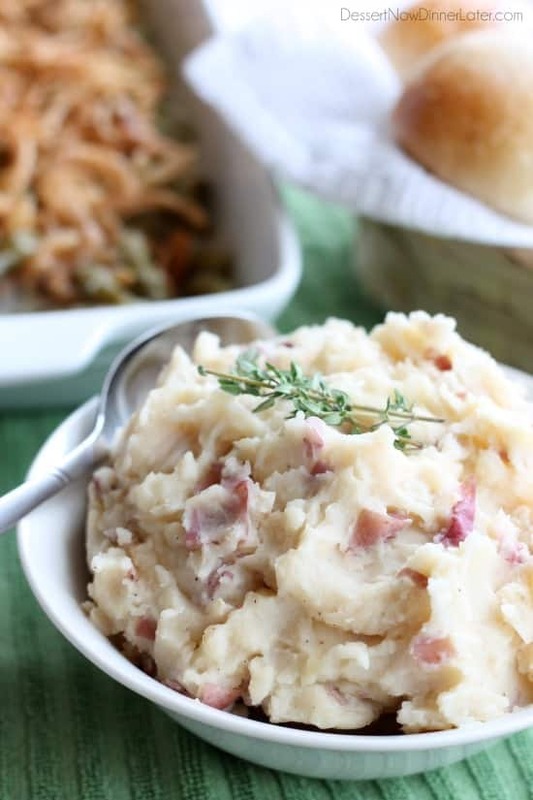 This is our absolute FAVORITE way to make mashed potatoes for Thanksgiving! 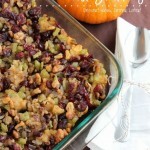 Pair them with a little turkey gravy and my oh my! So good! Actually, you don’t even need the gravy, because they are tasty to eat all by themselves! If you haven’t seen all the rage over BROWNED BUTTER in recipes, then you are missing out. Honestly, when it first became popular, I was really confused. In culinary school, I was never taught to brown butter for anything. Browning your butter wasn’t considered a good thing at least that I can remember. But if you are careful, and don’t burn your butter, brown butter actually adds a great depth of flavor to your recipes. 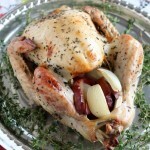 Pair that with the sautéed garlic, and you have the perfect mashed potatoes! 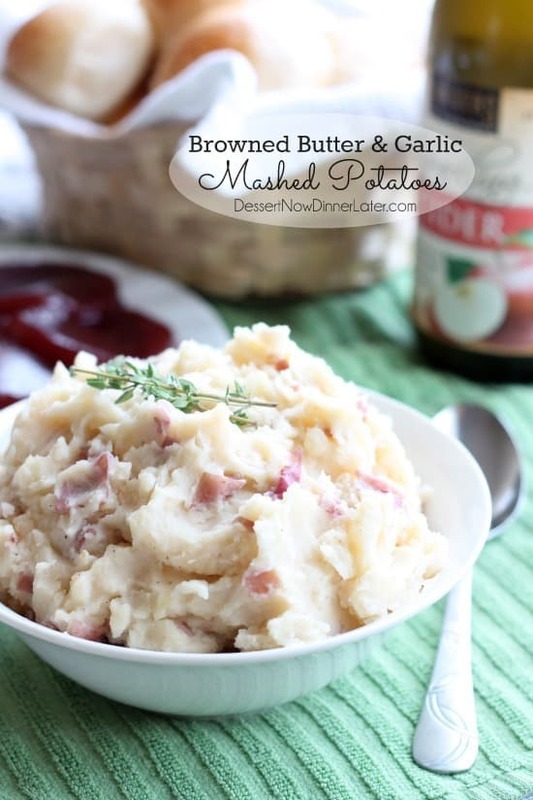 Our favorite potato to use in these Browned Butter and Garlic Mashed Potatoes is a red potato. We think they taste the best! We also like to leave the skin on and leave our mashed potatoes a little chunky. Obviously everyone’s preferences are different. You can still use russet potatoes, peel them, and mash them until smooth. It’s all up to you, but if you want a simple mashed potato, that still is seasoned well on it’s own, aside from the turkey and gravy, you MUST make these! Boil diced potatoes for 15 minutes or until fork tender. 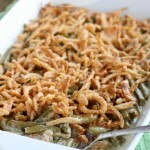 Drain and set aside in a large bowl. In a saucepan, melt butter. Cook until golden brown, about 6 minutes on medium heat. Add the minced garlic as the butter is starting to brown so that neither the butter nor the garlic, burns. Remove from heat and add to the cooked potatoes. Mash potatoes with a hand held potato masher, and add milk, salt, and pepper, until desired texture and taste. Enjoy! Brown Butter is one of my favorite things to use in baking. I’ve never had them in potatoes, but it sounds amazing! You should try it! 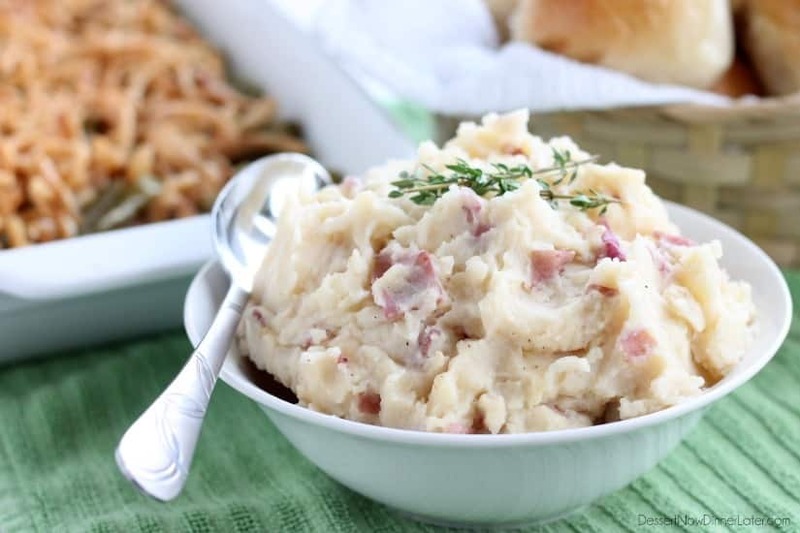 If you like it in baking, you’ll love it in these mashed potatoes! Holy YUM! Browned butter in mashed potatoes?! I bet that tastes amazing. Oh my goodness!!! Did you say brown butter? 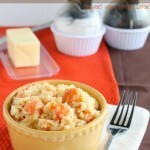 Along with the minced garlic, these have got to be the best mashed potatoes ever! They look absolutely mouthwatering! I think you would love these! They’re simple, but flavorful! Omg! WHY have I never done that before?! Next time I make mashed potatoes I’m so adding browned butter instead of boring regular. Love how thick and chunky these look! Pinned. Opened your world to a whole new kind of mashed potato! You’ll love it! How did I miss this post?? I never saw it – I LOVE mashed potatoes.. like LOVE them.. a little too much 🙂 These look great! Haha, I didn’t know that about you! Mashed potatoes are delicious, and we pretty much only have them for the holidays, so it’s exciting to make them over the top delicious!